Projects coming to The Linux Foundation (LF) for Continuous Integration (CI) services are generally given a similar infrastructure to the rest of our other projects unless there is a good reason to deviate from this configuration. This infrastructure enables the developers to all have similar workflows which makes it possible for the communities to help each other out with how to work in the environment. The development workflow enabled is in Figure 1. The standard infrastructure configuration that we build for projects is in Figure 2. 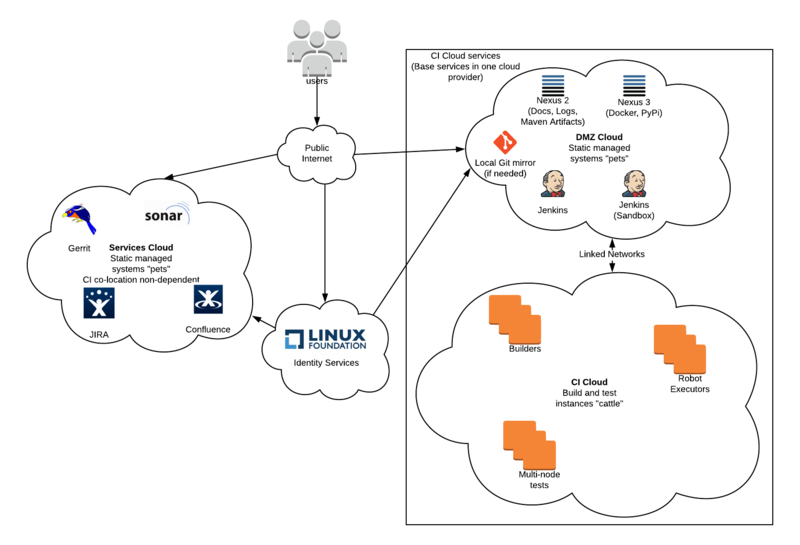 This design allows services to be logically separated and moved around to different cloud providers based upon the needs of the project as well as costs related to operating in given clouds. The basic configuration puts our CI systems along with artifact storage into a special DMZ Cloud which is where communities interact with the CI infrastructure itself. This cloud is then linked to a private dynamic instance cloud that has the ability to access the DMZ resources and external internet services, but not anything deeper into the core LF networks. Services that are not dependent on being co-located with the CI infrastructure will be in a different cloud. While this cloud, may be with the same provider, it may be a different provider. We do this to ensure that the CI build infrastructure itself has as little capability of potentially jail breaking / exploiting potential security issues in the code repository hosting in particular but also any other services hosted in the infrastructure. When services for a project are first being setup, the project will be in a pre-formation phase. During this phase most services allow a non-public, restricted set of people, access the resources. Pre-formation participants will receive invitations to one or more access groups. These groups will have their name set in a way to show that they are for pre-formation access. While the group names will include the demarcation of gerrit, this is an artifact of our naming groups that power Gerrit access rights. CI (Jenkins), issue tracking (JIRA), wiki (Confluence) will have access granted via this same group. Long term storage of CI logs is not complete during this phase as the log shipping mechanisms that we use for capturing the console logs require that the CI infrastructure be open to the public. To improve the log storage, as well as avoid potential issues with licensing for JIRA and Confluence the recommendation for projects is stay in pre-formation for as short a time as possible or if possible, skip a restricted formation phase altogether. The code contribution must be a squash commit. This means losing history. The reasoning for this is that The Linux Foundation requires that any projects that we host must conform to the Developer’s Certificate of Origin (DCO) indicated by a Signed-off-by commit message footer by the author of non-merge object commits in the code which indicates that they have read and agree to the DCO. Refer to https://developercertificate.org/ for the original text. LF does not presently have, nor is it aware of, tooling that will allow us to properly scan incoming repository histories to verify that they meet this. Requiring a squash commit of seed code is the way that we can definitively enforce this.